The Korean Garden Soswaewon provides diverse experiences to the visitors to enjoy and play with its various spatial qualities: visual corridors through the forest, different air flows of natural ventilation, temperature change through the flow of convection, constant filtration of light and shadow, and the mingling sounds of bamboos etc. These diverse experiences create an emotional space of Soswaewon, which closely ties together the human senses to the micro-natures of the garden. At the same time, Soswaewon amplifies the experience of feeling the very timid tactile changes of the nature through its multi axial spatial orientation, and thus establishing and re-establishing constantly different dialogues between the object - nature and the subject - human. The Garden does not identify one route over the other, nor does it suggest certain views, but continuously overlays one direction in connection to the other, and one view on top of another. Thus, the trace left by the numerous spots of the visitors in the garden becomes the signatures of the bodies, which is translated into the proposed installation as different coordinates in plan. 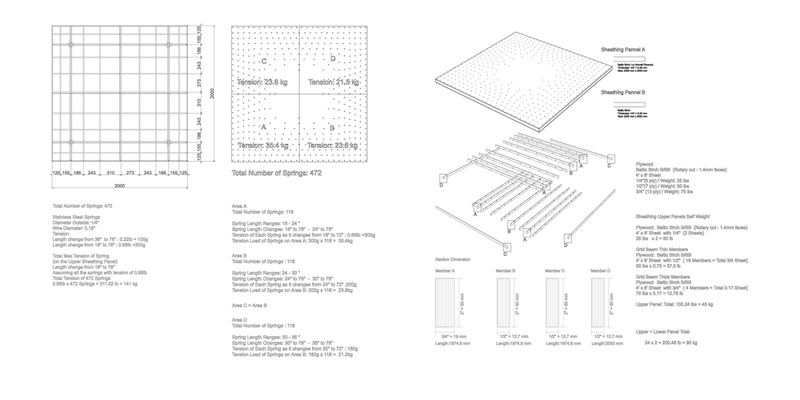 The proposed installation is a borderless field of suspended extension springs, all laid out in different numerical coordinates. As the human body opens up and engages the suspended springs, a three dimensional tension is created around the body, simultaneously experiencing the different strengths of tensions, transparencies, light reflection and vibrations of the spring material. The spring becomes an interactive medium in which it changes constantly its surface and volume, by how much it is being stretched out by the person who enters the installation. Going through the layers of tension, the installation suggests a transition from the public gallery space to a layered secluded privacy, and from the dynamic forces of the different tensions to a static inner space. The experience of rest resides in the micro-atmospheric condition of the field of tension, which becomes a metaphor of the Korean Garden Soswaewon. The experience of capturing the micro changes of the nature creates an emotional atmosphere to rest while meandering through the garden. 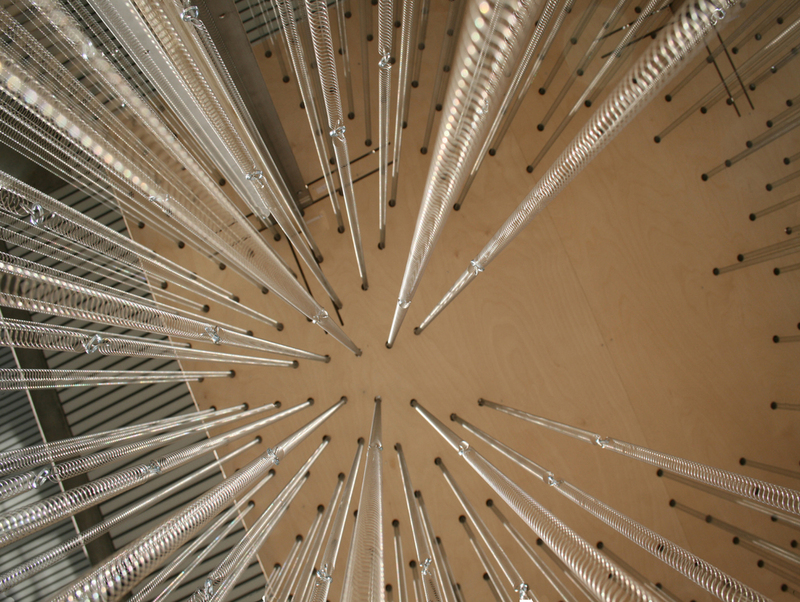 The installation of the tensioned field explores this micro-atmospheric rest through an architectural interpretation of the material qualities of a spring and its relationship of forces.